With our powers combined, we have 270 HP! Honestly, I’ve been pretty pleased with the SUM-LOT format. Jumpluff is good again, my penguins haven’t gotten totally demolished yet, and Zoroark is… still here. That said, we still have a lot to look forward to in the new year, like our obligatory overpowered new mechanic! Also this set is supposed to be based on Let’s Go: Pikachu and Eevee. I’m not seeing it though. I have taken the liberty of meticulously analyzing each and every card in the upcoming TCG set for playability, artistic value, and interesting mechanics. As such, I will be using this article to forgo whatever results I may have picked up from this analysis and just rant about which cards I like and don’t like. 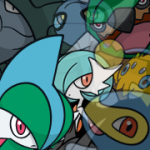 So without further ado, here is the ninth full set in the seventh generation, the first in 2019, and the equivalent of the Japanese Tag Bolt and Dark Order, Sun and Moon: Team Up. Standard Disclaimer: As usual, these are my opinions. Dominant Type(s) – Electric and Dark. Fitting for a set called “Lost Thunder”. Wait that was last set. 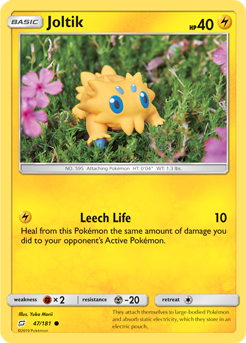 Featured Pokémon – All the pack arts depict two Pokémon each – Celebi and Venusaur, Pikachu and Zekrom, Gengar and Mimikyu, and Snorlax and Eevee. Notably, this is the debut pack art for Eevee and Mimikyu. The Elite Trainer Box depicts Pikachu and Zekrom, while the Theme Decks feature Charizard and Blastoise. Pokémon Debuts – None! Bar the whole new Tag Team thing, anyway. Random Fact – With a total of 33 across all rarities, this set has more GXes or EXes than any set before it. Oh boy, I get to START by explaining the new mechanic? 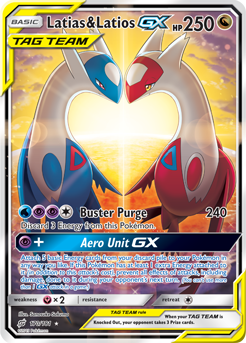 Tag Team GX cards depict two Pokémon each, featuring both Pokémon on one card. These cards behave in the same way as Basic Pokémon-GX. Fighting two-on-one sounds unfair already if you ask me. As a result, though, they give up THREE prizes on defeat. Additionally, each of them has a GX attack that follow the same rules as the old ones, except that they all have a + in their energy cost. This signifies that something extra happens if you have more than the required Energy. And on that note, have a big fat 270 HP Basic with a built-in Max Potion on its GX attack. And that’s not even the bonus effect for having an extra energy. Celesaur (expect this naming trend to continue) can pay one extra energy to dump your whole Discard Pile (and the four other Max Potions that are potentially there) back into your deck! Okay this time I’m SURE Beedrill will be viable! 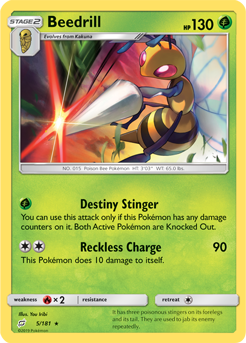 Also, the art on this Beedrill looks especially badass. Bonus points acquired. 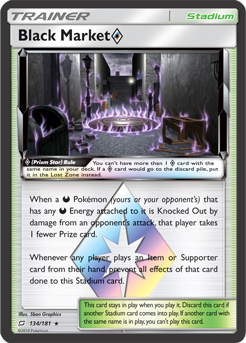 Somewhere around here is where the normal art of Karplord-GX would fall, if they hadn’t cut it from the set in favor of some weird box to promote the new mechanic. So this is where I’m talking about it. 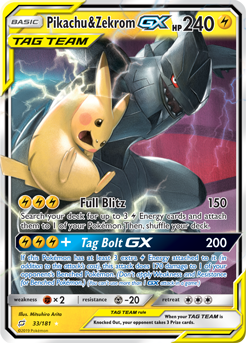 Karplord has a big ol’ boardwipe GX attack that hits the enemy Bench for 100 damage apiece and a solid 180 hit on its non-GX move (which can be used every turn provided you have a way to get 5 energy on in the first place – but that’s what the next card is for). Overall, good stuff. 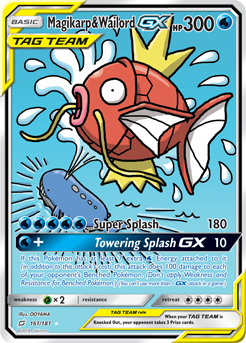 Best Magikarp card ever. I’m just here to remind you how cute Squirtle is. 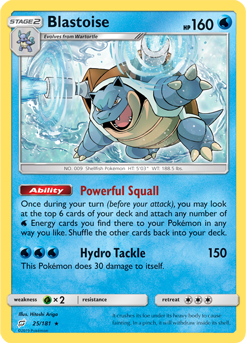 OH ALSO, Blastoise continues the trend of just about every Blastoise ever and serves as a way to accelerate Water Energy. 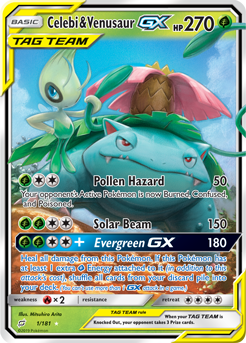 This iteration has a glorified Max Elixir effect – taking the top six cards from your deck and throwing any blue energy you find there onto your Pokémon without using your actual attach for the turn. Because taking 4 prizes in one move is Fair. Honestly, Zekchu may finally be the card that kills off Lele. 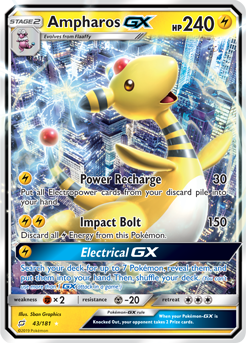 The ability to casually drop a nuke on two GX Pokémon at once is incredibly powerful, even if it costs an effective six Lightning and can only be done once per game. Can we talk about how adorable the designs are when they go out of their way to make them look cool? And those eyebrows are perfect. Amphy has an innate synergy with the item Electripower, released last set. Get four of them in your hand, play all of them, do 150 damage for one energy, and get them all back. Or do 270 damage and don’t get them back. The choice is yours. Also Ampharos, as usual, looks fantastic. Just another badass looking Lightning coming through. 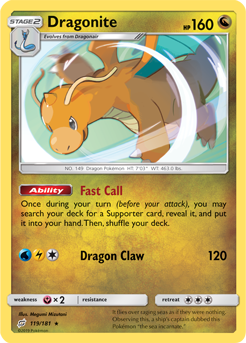 Ignoring how it looks, it’s essentially a Trainer card compliments of its Ability. 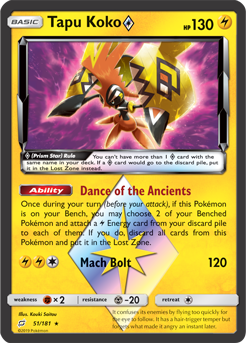 Power up your Lightning Pokémon, banish Tapu Koko to the abyss (Lost Zone). Nothing out of the ordinary. So this is where I talk about my prerelease and tell you to go to one for next set. Go to prereleases. They are fun. 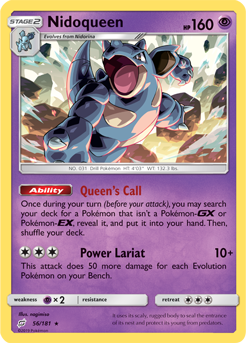 And you have a chance at getting to use something like Nidoqueen, who was the MVP of my 2-1 prerelease deck. That said, Nidoqueen is just a darn good card overall. She can easily hit 210 damage for 3 energy. 260 in certain decks if you’re feeling cool. 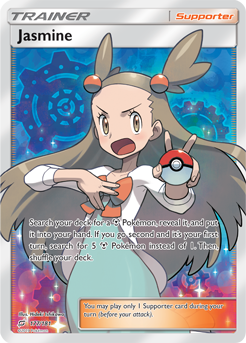 Also she has an Ability that lets you search your deck for any Pokémon of your choosing once a turn, provided they aren’t an EX or GX. Yes, this card looks amazing. No, it’s not very competitive. Yes, I am biased because Absol is my favorite Pokémon. Doesn’t matter though. Seriously though, the Ability to punish the all-too-common Basic Pokémon by dumping an extra colorless onto their retreat costs is amazing, but still not good enough to see play. 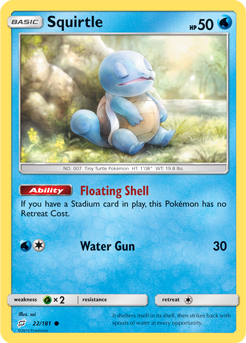 Taking a break from Smash to grace the TCG with his dark presence once more, The Ring’s Raging Flame returns to glory with all the seasoned affection TPC showers on all its Smash reps bar Squirtle and Ivysaur. Which is to say an undeserved EX/GX that does obscene amounts of damage. It has 250 HP, but damages itself for 20 to get three dark energy for free with its Ability, then uses those to hit for 130 and discard any pesky DCEs your opponent may have on their Active. I can’t even make fun of their names by combining them. It just ends up as either Latias or Latios. My disappointment is immeasurable, and my article is ruined. Anyhow, Lati@s-GX (close enough) is essentially a better Ultra Necrozma. Just run them with a couple Malamar and watch the 240 damage cycle happen. Pictured is the Super Special 4th Art that all the Tag Teams get (though many of them have been relegated to tin promos). Lati@s just happen to have the best one. It’s cute. Tapu Lele-GX’s Wonder Tag, except you get a free Supporter every turn instead of just once. Haha! You thought it was Pidgeot! But it was I, PIDGEOTTO! 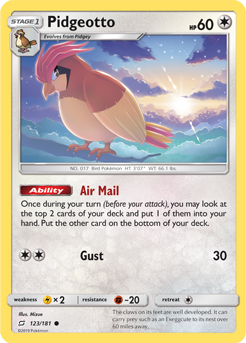 The best member of the Pidgey line has a really fun Ability that essentially lets you get an extra card each turn, but instead of drawing it from the top you get to pick one of two choices. 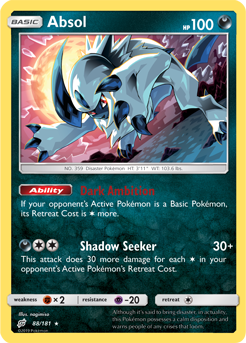 Your opponent can’t take any Prize Cards for KOing non-GX Dark Pokémon while this card is in play (rather, they take one less for any Dark KO). And it is immune to Field Blower, so take that, Life Dew (a Tool that also reduces the number of prizes your opponent can take). It’s just a good draw supporter. That’s all. Don’t have many cards in your hand? Play Erika’s and draw a bunch. It’s better than Hau anyway. This card is not broken. Yet. I’ll get back to you next set. 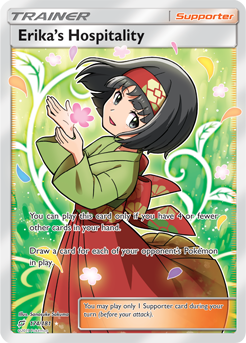 In other news, Full Art Jasmine (pictured) is precious and must be protected at all costs. This is your reminder that Comm is finally back in format for the first time since the BW era, and it’s one of my favorite items so yeah. 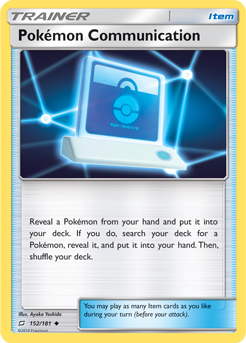 It’s a simple trade – give a Pokémon back to your deck, get a Pokémon out of it. And boy is it effective. That’s all the time I have for today. 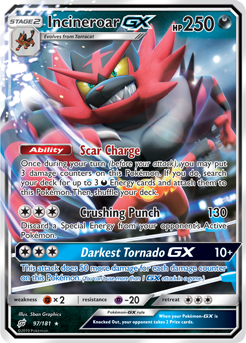 Make sure to pick up some cards from Sun and Moon: Team Up when they release on February 1st! 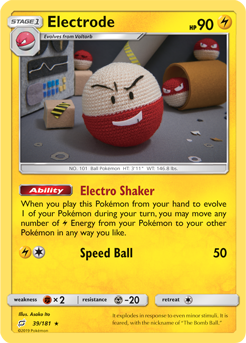 If you have any thoughts on this new set, tell us in this set’s PokéCommunity discussion thread. Have fun teaming up with your friends (provided you have them unlike me), and I look forward to being seeing your Unbroken Bonds when we meet again in May. Edited by bobandbill, Erik and Rabinov. 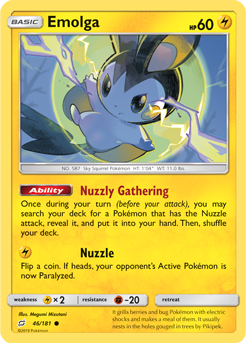 All card images from pokemon.com. The Plankton gif is from Spongebob Squarepants.